By enhancing the DNS service provided to Active Directory (AD), IT organizations see immediate benefits in the performance, speed, and accuracy of data across both DNS and AD. A highly effective approach to providing enterprise-grade DNS services in your Microsoft Active Directory environment can immediately enhance security, manageability, and availability for core network services. 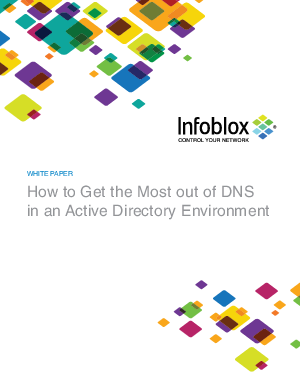 This white paper will share insights on the reasons why migrating to Infoblox DNS will provide superior DDoS protection, centralized management, and enhancements to AD functionality. This detailed and practical resource can be the first step in transforming your Microsoft environment. Request your copy of this white paper to learn how to get started today.